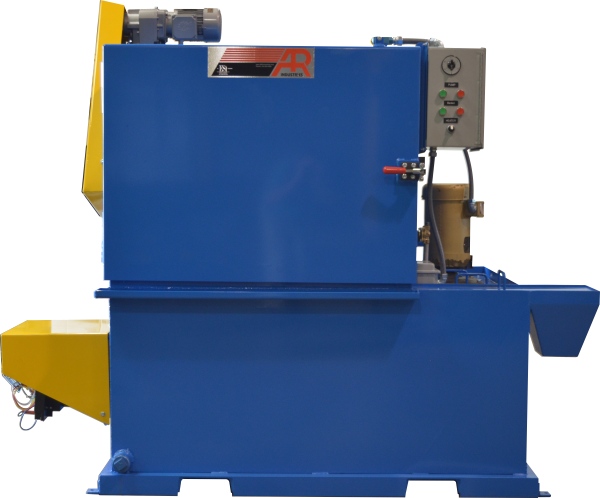 Our flow-thru washers are popular for cleaning large garbage containers, medical waste bins and large metal parts. Small parts or containers can also be washed while inside our custom baskets. Completely customizable and available in all stainless steel. Spray manifolds on the top, bottom and sides contain stationary brass or stainless steel spray nozzles with powerful 45-60 psi spraying power that doesn't miss a spot. Wash and rinse water tanks are heated with your choice of natural gas, propane or electric heating elements. Water is blown away with 5 HP blow-off motors at the end of the wash so everything comes out dry. The most efficient way to clean small medical sharps containers in bulk is with our Mini Flow-thru washer. Great for any small containers, baskets full of parts or small parts like car alternators, starters or CV axles. 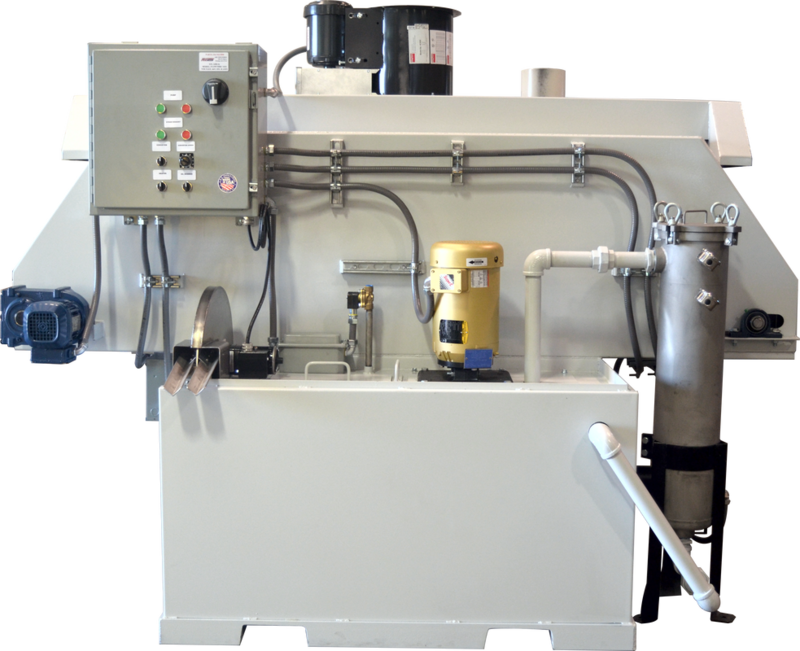 This smaller version of our standard flow thru washer still includes water filtration, oil skimmers and choice of natural gas, propane or electric heating elements. 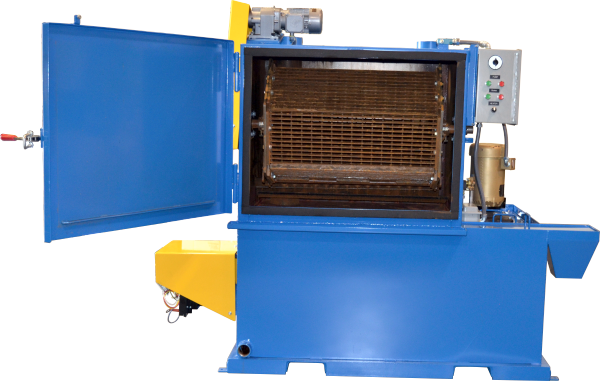 Our tumble washers are great for washing air brake boosters, clutch components, water pumps and heavy duty brakes just to name a few. The baskets are reversible to make loading and unloading easy. High efficiency burners make start up time quick with short recovery times during operation and you can choose natural gas, propane or electric burners. High volume sealless pumps have no bearings exposed to water for providing high pressure water streams through the individually adjustable spray nozzles. Easy clean out sludge traps make cleanup a breeze. Replaceable rubber seals around the door are set in a specially engineered frame for leak-proof operation and maintenance is simple since all parts can be removed and replaced. Options include a 7 day timer for the heating element, fresh water rinse and a sludge pump to remove semi-solid waste. BASKET CAPACITY 4 CU. FT. 6 CU. FT. 12 CU. FT. 20 CU. FT. TANK CAPACITY 130 GAL. 170 GAL. 170 GAL. 220 GAL. 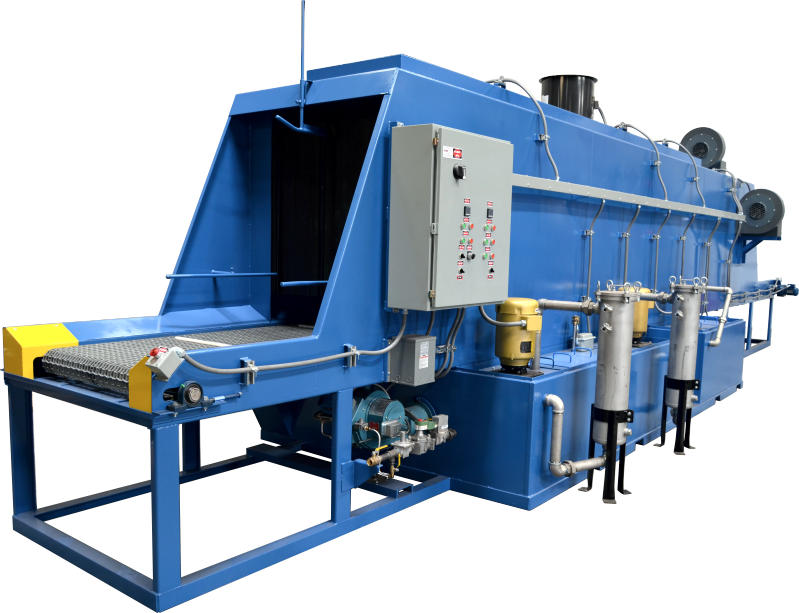 Our cabinet washers are customized for what you are washing, like waste containers or transmissions for example. Some applications need a 500 lb. capacity turntable or a parts tree and others require guide rails or brackets. High pressure spray nozzles are adjustable on the top and sides with stationary nozzles on the bottom for complete coverage. Water temperature stays between 150 and 170 degrees during operation and a safety switch on the door ensures it doesn't spray while the door is open. The reservoir tank is sloped on the bottom to make sludge removal easy and an oil skimmer is optional. 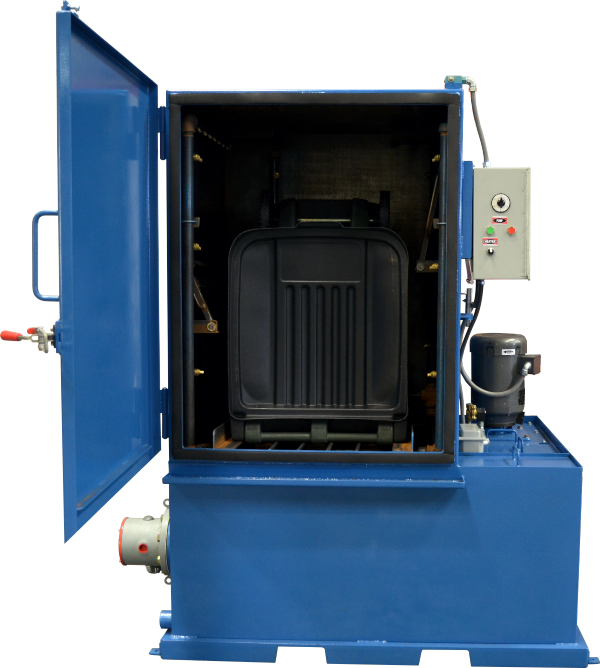 Designed with the help of a transmission shop, our aqueous transmission washers are built with the operator in mind. A lever inside assists with removal of large transmission bodies and a side spray wash station allows for washing the small parts associated with transmission rebuilding. 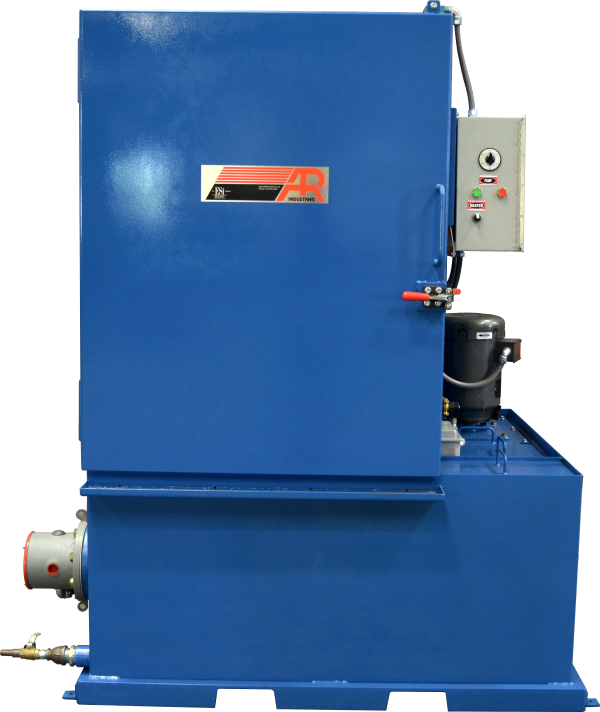 All of our cabinet washers come with the choice of natural gas, propane or electric heating elements to fit your shop. 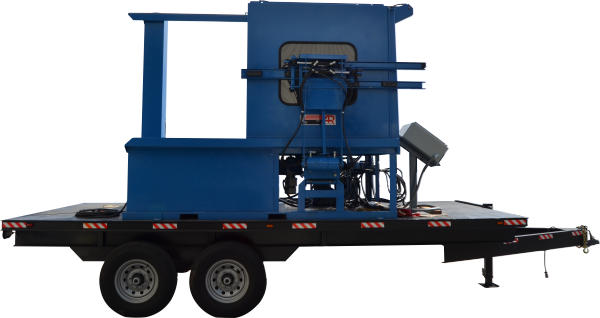 NEW for 2017, this mobile washer is our cabinet washer built onto a trailer designed specifically to clean waste containers inside and out. 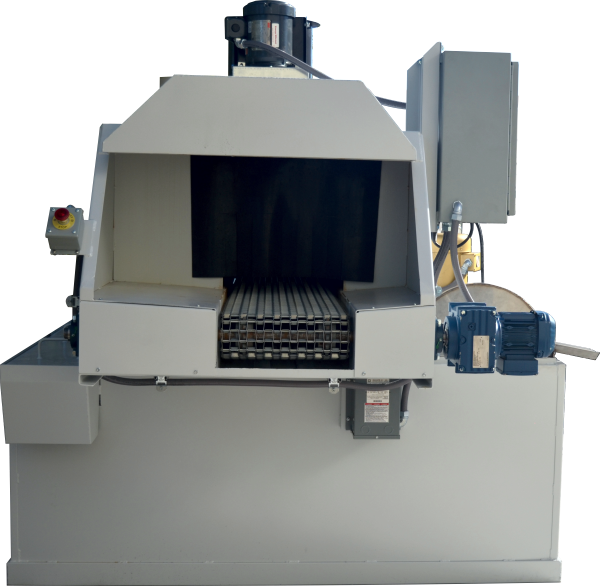 Manually controlled arms pick up a container to place it into the washer and when the wash cycle is finished they return the container back to the ground. Push buttons to open and close the automatic door means you never have to leave the control console to wash a container. A turntable spins the container while high pressure spray nozzles stream 150 to 170 degree water from every angle to get all the dirt and grime off in less than a minute. The bottom of the reservoir is sloped for easy removal of sludge to keep your washer clean. Bring the wash to your customers for a convenient way to wash their containers.